Shah Rukh Khan had been to Dubai for an interview and he also later was invited for the Ramez Taht El Ard's prank show at Abu Dhabi desert. Shah Rukh Khan seemed completely unaware that it was a prank show. After his interview in Dubai, he was rushed to the sets of Ramez's show and on the way, SRK's car landed in quicksand. SRK was accommodated with two other people who also started to sink along with him. While Shah Rukh and his two friends were screaming for help, Ramez came in a dragon costume and started to scare them. After scaring them for some time, Ramez came out of the dragon costume and said it was a prank. 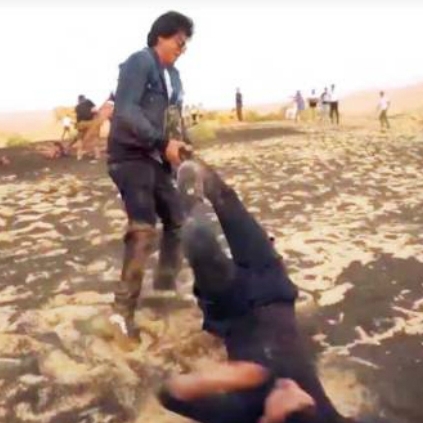 Shah Rukh Khan then asked the supporting staff to take him out of the sand. And, once he came out he ran toward the show host, Ramez and pushed him down on the ground and raised his hand to almost punch him. Ramez, on the other hand, pleaded him to forgive and take this act sportively but SRK denied and was seen super angry about the whole prank and warned him not to come close towards him else he would hit him. Shah Rukh Khan then rushed to his car and quickly went off. Suspense revealed: Here is the villain for Sasikumar’s next! Hot: Priya Bhavani Shankar to make her debut in films! Venkat Prabhu’s next film shoot starts today! A good reception for this old theatre’s major renovation!